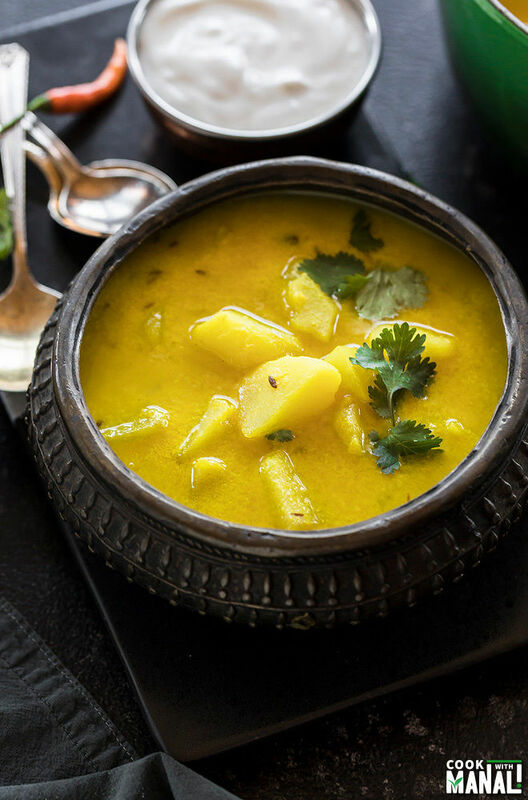 Spicy crushed potatoes dunked in a tangy yogurt curry – that’s my favorite Dahi Aloo for you! At my home, mom made dahi aloo whenever we were bored of eating the same veggies. This was a great change to our usual meals and we really relished it. My COOKBOOK is about to release in less than a week! I can hardly believe it! It feels like yesterday when I signed the contract with the publishers. The next few months just flew by with testing recipes and photography. I won’t lie, writing and photographing a cookbook is tons of work! We are talking about hundreds of recipe testing and thousands of pictures here. It’s a lot of work but now when I hold my book in my hands, it all seems worth it. It’s a great feeling to see your work in print. I just hope that everyone enjoys the recipes! And in case you still haven’t pre-ordered my cookbook, please do it now! Coming back to today’s recipe of Dahi Aloo. Dahi=Yougurt and Aloo=Potato, so this is a potato and yogurt curry. 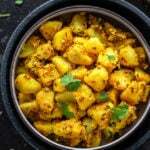 How To Make Dahi Aloo? This sabzi was made pretty often in my home. Mostly, when we would get bored of eating the same veggies or when there were no fresh veggies in house and only potatoes, mom would make this! It’s such a simple curry. There’s almost no prep work except boiling the potatoes. I would compare this to kadhi, it’s has a tangy taste but there is no chickpea flour (besan) here. I know some people add onion, tomatoes to their dahi aloo but this is how it was made in my home and I am sharing the exact version here. My recipe has no onion, no garlic and no tomatoes. The best part about this dahi aloo recipe is its simplicity. It has few ingredients but the flavors really shine through. To make dahi aloo, we first boil the potatoes and then slightly crush them. You don’t want mashed potatoes but you also don’t want to cut them into cubes. So use your hands and slightly crush them. They taste so much better this way, trust me. 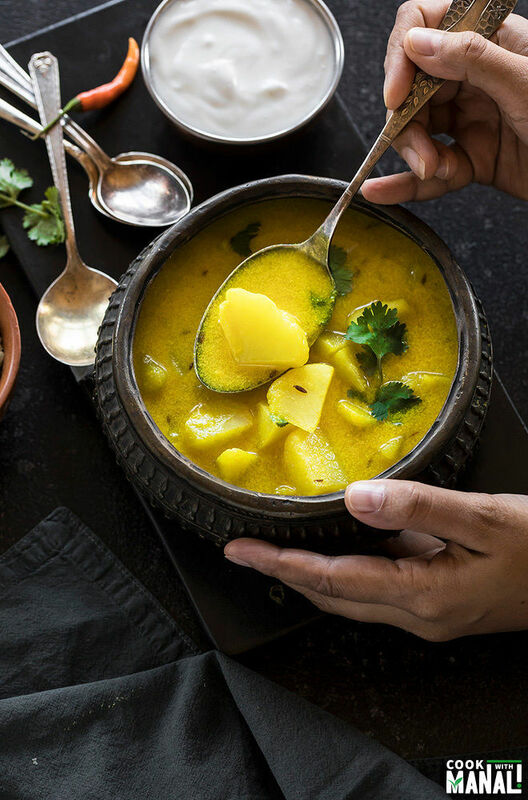 Once you have the potatoes ready, it’s just a matter of few minutes and the magic of a simple tadka (tempering)! How to Prevent The Yogurt From Curdling? Since we are using a lot of yogurt here, there are chances that it might curdle when you add it to the pot. 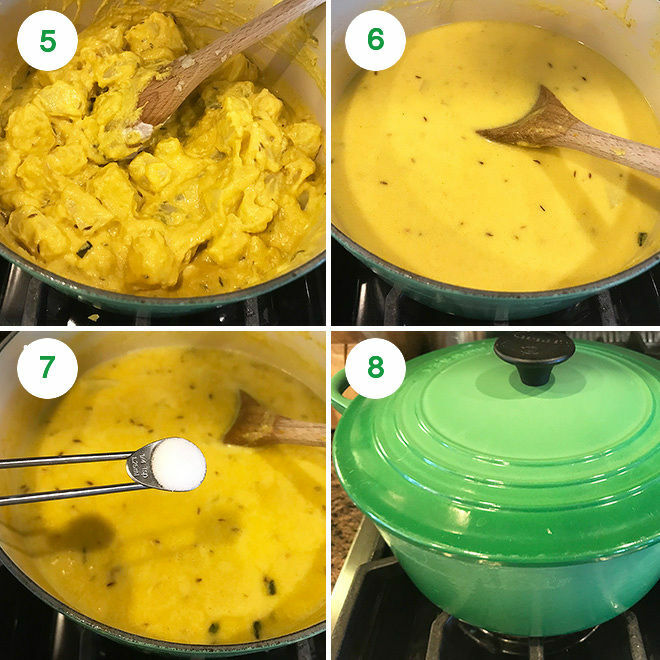 So, how do you prevent yogurt from curdling when adding it to curries? 1. Always whisk your yogurt until it’s totally smooth before adding it to the pot. Also make sure it’s at room temperature. 2. Remove pan/pot from heat and then add yogurt to it, one tablespoon at a time. 3. Keep whisking continuously as you add the yogurt. Once all the yogurt has combined well with everything else, then place the pot back on heat. 4. If you still have trouble, try adding little stabilizer like chickpea flour or cornstarch. A teaspoon or two, mix it well with yogurt and then add the yogurt to the curry. For dahi aloo, I would recommend using cornstarch, though I didn’t use any stabilizer here. 5. Add salt at almost the end of cooking in curries calling for yogurt. If you follow these tips, you will never have a problem with the yogurt curdling. 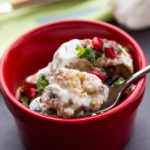 Can You Make These Dahi Aloo for Fasting/Navratri? Absolutely! 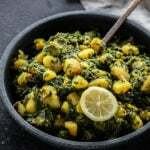 This recipe is perfect for navratri/fasting season. Just skip turmeric and coriander powder if you don’t use it during fasting. You can add cumin powder in place. And of course use sendha namak (rock salt) in place of regular salt. Whisk the yogurt until smooth before you start. 1- Boil 3 medium potatoes. You can either boil them in a pressure cooker or a stove-top. If using a traditional pressure cooker, cook on high heat for 7-8 whistles. If using a stove-top, cut into quarter and cook for 20-25 minutes until done. Peel the skin and crush them slightly. You just want to break them into pieces, best done by your hands. Do not mash them. Set them aside. 2- Heat a heavy bottom pot or kadai on medium heat. 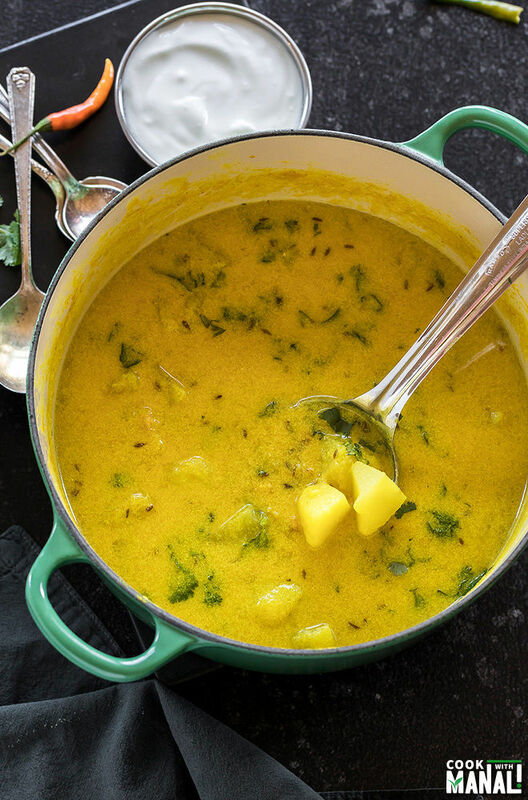 Once hot, add ghee to the pot and then add the cumin seeds, chopped ginger and chopped green chili. Saute for 1 to 2 minutes until the ginger starts turning golden brown in color. 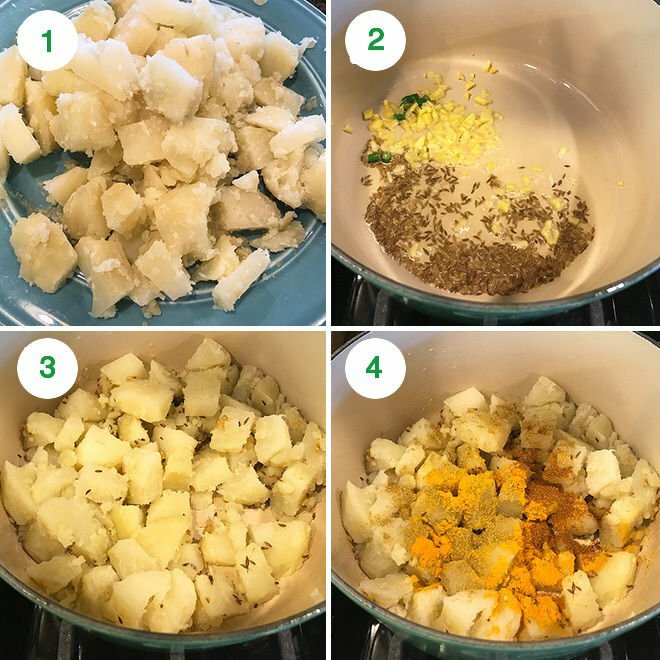 3- Stir in the crushed boiled potatoes into the pot. 4- Give a quick stir and then add the spices- coriander powder, turmeric and red chili powder. Toss the potatoes until well coated with the spices. 5- Now remove the pot from heat and then stir in the yogurt, one tablespoon at a time and stirring continuously. Keep stirring for 2 minutes until all the yogurt is well combined, this prevents the yogurt from curdling. This is also why we also remove the pot from heat while adding the yogurt. 6- Transfer the pot back on to the stove and add in 2 cups water. Let it come to a slight boil. 7- Lower the heat, then add the salt and mix. 8- Cover the pot and let dahi aloo simmer on low heat for 3 to 4 minutes. 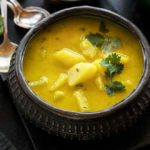 Garnish dahi aloo with cilantro and serve with roti/rice/poori or paratha. I add quite a bit of water as it thickens as it cools down. If you’ve tried this Dahi Aloo Recipe then don’t forget to rate the recipe! You can also follow me on Facebook, Instagram to see what’s latest in my kitchen! 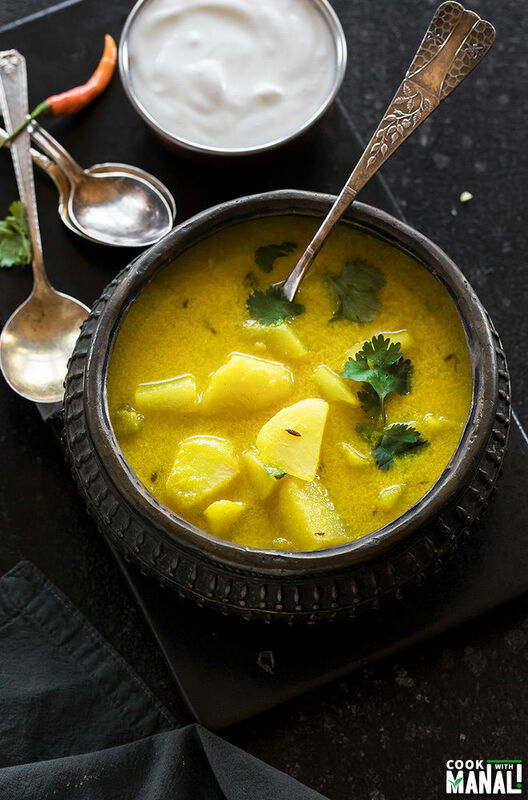 Potatoes in a tangy spiced yogurt curry. This is my favorite way of making Dahi Aloo- really simple ingredients and great flavors! Boil 3 medium potatoes. You can either boil them in a pressure cooker or a stove-top. If using a traditional pressure cooker, cook on high heat for 7-8 whistles. If using a stove-top, cut into quarter and cook for 20-25 minutes until done. Peel the skin of the potatoes and crush them slightly. You just want to break them into pieces, best done by your hands. Do not mash them. Set them aside. Heat a heavy bottom pot or kadai on medium heat. Once hot, add ghee to the pot and then add the cumin seeds, chopped ginger and chopped green chili. Saute for 1 to 2 minutes until the ginger starts turning golden brown in color. Stir in the crushed boiled potatoes into the pot. Give a quick stir and then add the spices- coriander powder, turmeric and red chili powder. Toss the potatoes until well coated with the spices. Now remove the pot from heat and then stir in the yogurt, one tablespoon at a time and stirring continuously. Transfer the pot back on to the stove and add in 2 cups water. Let it come to a slight boil. Lower the heat, then add the salt and mix. Cover the pot and let dahi aloo simmer on low heat for 3 to 4 minutes. Woo it looks so good and absolutely I need it for my current flu 🤒 Btw, congratulations for your coming cookbook. It will certainly be great!!! I don’t believe I’ve ever had Dahi Aloo, but I definitely understand the need to mix veggies up. Laura and I were just talking about that last night actually. We tend to get bored with the same thing over and over, and this sounds like a fun way to mix it up. Looks delicious, my friend! I am going to cook it for my Navratri fast. Looks so good. Amazing recipe. Just how my mom makes it. It was too late in India to call her so I decided to find it out on Google and found your recipe. My dahi ke aloo is prepared and tastes just like how it should be. If memory serves me right (after all, I’m past 70), my grandma used to make something very similar on her “fasting” days. However I remember it as not yellow in color. 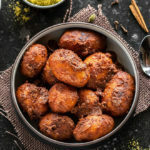 Can this bhaji be made with buttermilk instead of yogurt? Absolutely love it!!! I made it 3 times and is always a hit. What other can I try? Whatever you like 🙂 There are tons of recipes on the blog..